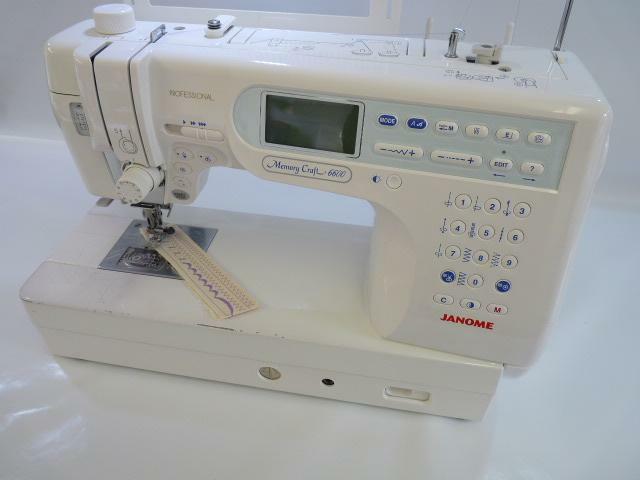 The Memory Craft 6600P is a fully computerized sewing machine from Janome, one of the leading manufacturers. The 6600P includes a great range of stitches (135 in total), 7 buttonhole functions in addition to Janome's AcuFeed technology for perfect fabric control - no more mismatch at the end of seams. The 6600P is not your usual home sewing machine and makes the perfect choice for everything from garments to quilting and home decoration. Thanks to it's superior feed system the machine can handle delicate silks one minute to jeans the next. Topping an amazing 1000 stitches per minute you'l find that your sewing projects are finished in no time at all. The machine also boasts an extra large arm space (230 MM, 9") as well as a programmable needle up/down. The machine has a few paint chips and scissor marks round the front side and by the needle plate but does not affect the machines capability.